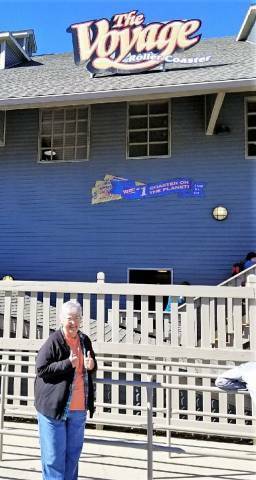 My freaking 74 year old grandma, who hasn’t rode a roller coaster in 50 years, decided that she was going to ride the voyage today at @HolidayWorld & she did & loved every second of it! ?? We contacted Allie to see about her bringing her grandma to join us on our last podcast episode. Sigh, we couldn’t work out the timing. If you enjoyed grandma’s story, I’ll bet you’ll also want to read about Wally’s ride on Thunderbird when he was a spry 91. And here’s the tale of Papaw (from the family who owns Santa’s Candy Castle here in town) and his ride on The Voyage back in 2008. Yes, The Voyage is closed for the season. That doesn’t mean, though, there’s nothing going on out there in the woods. The Coaster Cats are finishing up the return run, replacing 650 feet of track with IPE wood. We’ll watch for Judy in the queue next May!